A practical and motivational book: Habits for Success - Inspired Ideas to Help You Soar is the perfect blueprint to help manifest a life of progress, purpose and fulfillment. 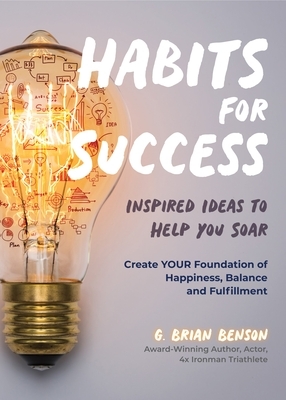 Author G. Brian Benson offers an informative, inspiring and unique look at growth, self-awareness and success. A self-help book for an authentic life: Habits for Success was written creatively, consciously and with heart. Using his own growth process, triumphs and hero's journey, the author weaves authenticity and vulnerability into his habits, ideas and stories to entertain and inspire the reader. Increase your self-awareness, manifest your dreams: Habits for Success is written in laymen's terms but with an incredible amount of depth, allowing the reader to reach new levels of understanding and growth. It is a wonderful mix of heart, informative ideas and entertaining journey. It is a self-help book that doesn't feel like one. The insights shared and the tools provided are tailored for life-long success.